This simple recipe for Crock-Pot Big Ole’ Pot of Chili feeds 12 or more people. Perfect for when you need a large batch of chili to take to a gathering. My kids are huge fans of chili for dinner (or lunch). They love the kidney beans the best, which I find a bit funny because I grew up not ever really even eating kidney beans. Yet here my kids are eating them like candy. Chili bean flavored candy…but still… kind of funny. 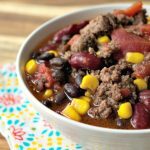 This chili recipe is the one I make all the time because it make a great big batch that we can enjoy for dinner one night and usually have some leftover for lunch the next day. It is also a great recipe to take to big gatherings or pot-lucks. I often am asked to bring a pot of my chili to church events because it feeds a bunch of people. And if you need it to feed more you can easily double the recipe. Or I get out a second slow cooker and make a BIG batch of chili. Shredded cheddar cheese, Monterey Jack cheese or even pepper Jack cheese to add some spice. Crumbled queso fresco (Mexican fresh cheese) is nice too. As I mentioned there may be leftovers which of course make a great lunch the next day. Sometimes I will make up some baked potatoes and we will top them with the leftover chili and whatever toppings leftover from the night before. This makes for a filling and satisfying lunch. To make this recipe you simply start with browning off some ground beef in a skillet with some onion and garlic on the stove top. Drain off the excess fat from the cooked hamburger (there may not be much since you used extra lean ground beef) and dump it on in your slow cooker. Then simply add the rest of your ingredients…canned (or homemade) kidney and black beans, chili seasoning, canned tomatoes with green chilies and canned corn. This recipe calls for 1.25 oz. chili seasoning. This measurement is the standard package size found in the grocery store. You can very often find this in little packets in most grocery stores for around $1.00. However it is very simple to make your own at a fraction of the cost and our recipe for Homemade Chili Seasoning Mix is super easy to make and you know exactly what is in it! This recipe makes a big batch of chili that serves at least 12 people. It is perfect for serving a crowd or having several servings as leftovers for lunch which you can freeze and just heat up in the microwave. In a large skillet on the stove top add the ground beef, onion and garlic and cook and crumble the ground beef until it is browned. Drain off any excess fat from the meat (if there is any) and add cooked meat mixture to a 6 quart or larger slow cooker. Add remaining ingredients to the slow cooker and mix to combine. Cover and cook on LOW for 6 hours or on HIGH for 4 hours. Cook for 4 hours on LOW or 6 hours on HIGH. 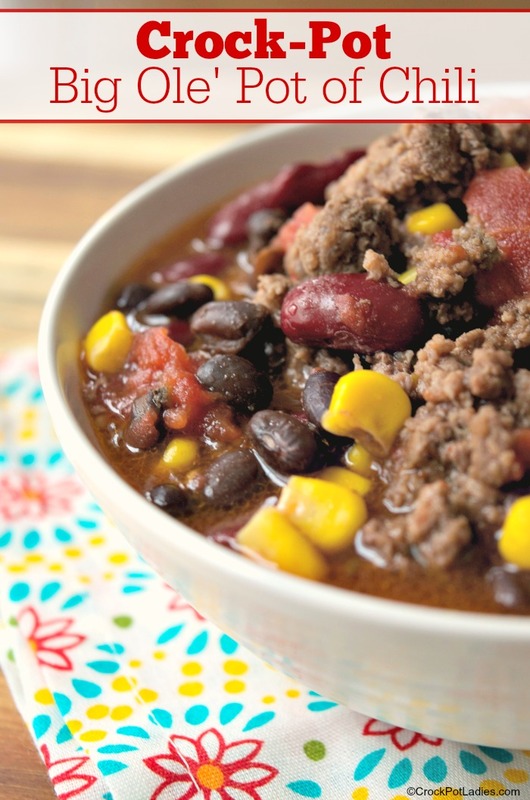 Ladle chili into bowls and top with your favorite chili toppings and/or serve with cornbread. 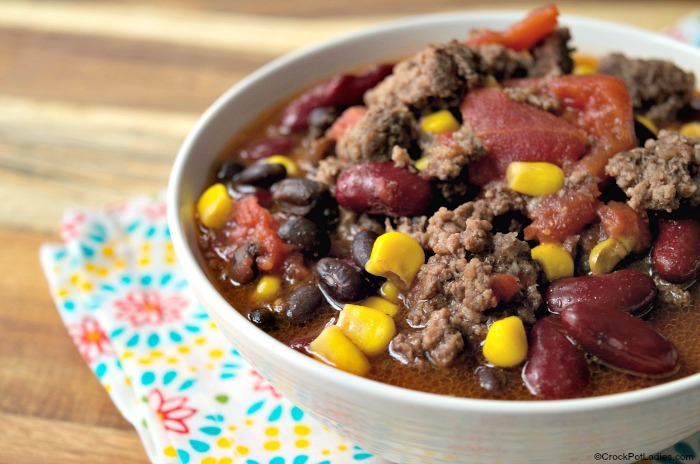 This recipe is gluten-free when using either a gluten-free store bought chili seasoning mix or our homemade mix found HERE. You consider a 6 Qt. 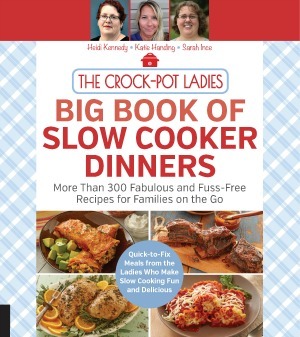 Slow Cooker a “Big ‘Ole Pot?” I would have thought an 8 Qt. or the Hamilton Beach 10 Qt Slow Cooker as big. Mabe you should bump up the recipe for the 10 Qt., then you can call it “Big “Ole Pot”. Will have to consider that Walter. Cook time:. Please verify Low for 4 hours or high for 6 hours. Why do you cook it longer on High? Sorry about that Coy. I got the numbers reversed when I wrote out the recipes. I have edited the recipe to reflect the proper cooking time of 6 hours on LOW or 4 hours on HIGH.